Lentinula edodes commonly known as the shiitake mushroom, is the second most popular cultivated edible mushroom in the world. Shiitake mushrooms are valued as a delicious food and a meat substitute. Pharmacologically, L. edodes expresses lentinan (LNT) that possesses anti-tumor and immunomodulatory activities. On the biotechnological side, L. edodes is a white-rot fungus that grows on lignocellulosic substrates, thus the spent mushroom substrates are economical sources of enzymes that degrade lignocellulosic wastes effectively. L. edodes follows a typical basidiomycete life cycle. Two monokaryotic mycelia with compatible mating types fuse to form a dikaryon. Under appropriate environmental conditions, dikaryotic mycelia aggregate to form a primordium and then mature into a fruiting body. Our understanding of the genetic structure and molecular biology of L. edodes is still fragmented. 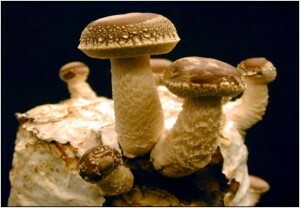 Together with the genomic information from other mushrooms, L. edodes genome sequence will significantly facilitate the elucidation of the mechanisms of the fundamental biological processes such as wood degradation, mating, fruiting body initiation and development in this premier cultivated edible mushroom. We have finished the genome sequencing of L. edodes. To enhance the use of the genome sequence, it is necessary to provide a searchable database of annotated genome sequence. The genome sequence will form the basis for the understanding of the genomic structure and function of L. edodes.